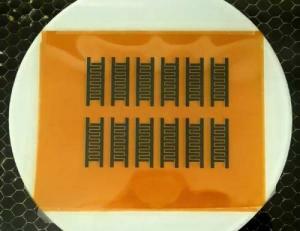 Researchers at the Rice University have devised a process in which a computer-controlled laser burns through a polymer to create flexible, patterned sheets of multilayer graphene that may be suitable for electronics or energy storage. The process works in air at room temperature, cancelling the need for hot furnaces and controlled environments. The product of this process is not a 2D piece of graphene but a porous foam of interconnected flakes about 20 microns thick. The laser doesn't cut all the way through the base material, so the foam remains attached to a flexible plastic base. 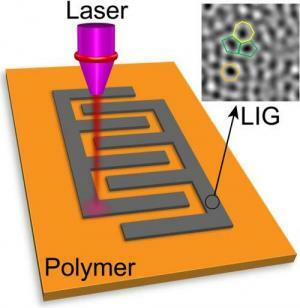 The laser-induced graphene (LIG) looks defect-laden under a microscope, with a massive amount of five and seven atom rings. It turns out, however, that this unusual structure enables better trapping of electrons and can store charges much better than "perfect" six ring graphene (despite being less conductive). In fact, the researchers say that the LIG can be turned into a supercapacitor rather easily. The researchers claim that this process is scalable and might allow for rapid roll-to-roll manufacture of nanoscale electronics. The base material for the process, polyimide, is cheap and the entire process is done rapidly, which can make for a scalable industrial process. The process is, however, limited for use with this specific base material. In February 2013, UCLA researchers enhanced their laser-scribed graphene supercapacitor technology using simple DVD burners.